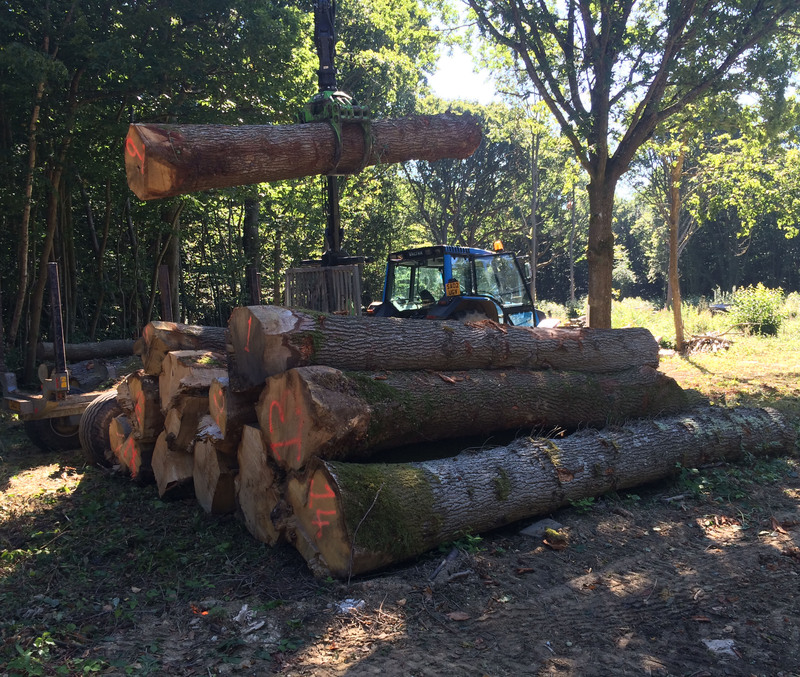 Forestry & Arboricultural skill course, whilst an important foundation are only the start of the learning process, which is developed and supplemented over time in years of contracting. Over the summer I’ve completed a range of commercial jobs, some of which are outlined below with key learning points identified. An existing client contacted us earlier in the year following some storm damage to a scots pine, one of two growing together in the far right corner of the garden, overhanging three properties. Part of the top of the nearer tree had snapped out and had damaged fences below, and partly ended up in his neighbor’s decked seating area. Upon inspection I recommended that the trees be removed due to the size of the torn out section likely to lead to decay on the main stem of the first tree and the furthest one had a couple of defects including a large hazard beam, plus the trees had grown together and managing one without the other was not a sensible option. Since the trees were covered by a group Tree Preservation Order I completed the application forms and submitted them, we got approval for the works several weeks later. At this time I also considered the best way to complete the work, in terms of safety and efficiency. Provided that taller tree was safe to climb this would offer high anchor points and a sensible drop zone for the branch material. Larger stem wood could be rigged and then free falled as a cushion developed. MEWP access was poor, limiting the size of the machine we could deploy, making a safe position away from the base of the trees a non starter. This would have meant micro size sections being cut and dropped. On the day set for the job I arrived early and completed the SSRA document and later briefed the crew on the main points as well as the check list from the rigging research. We had a set of green weight log tables to refer to. I set a throwline high in the first tree, which was pull tested from a safe distance, and then set up an access SRT system it was slightly overhanging in free space and it allowed a large amount of base ivy to be bypassed. This left us with a rescue line in the tree at all times through the day. The rigging set up consisted of our GRCS initially set up with a 16mm tuefelberger Sirius line which was run later in parallel to a 14mm English braids rigging line, this allowed more efficiency rigging the furthers part of the second tree, as the lines had to be hauled back after each lower, and some of the cutting positions were extreme.